Humber College has three main campuses in the Greater Toronto Area and Orangeville, which serves over 30,000 students. While Humber continues to expand to meet its growing needs, it has also developed and implemented a long-term, decision-based Integrated Energy and Water Master Plan (IEMP), with aggressive goals for energy efficiency. As part of the IEMP, Humber is looking to perform a deep synergistic energy retrofit of Building NX at its North Campus. Building NX was built in 1989 and is 48,269 ft2 (4,487 m2). It has a total of 5-stories that are mainly used for administration and public safety offices. The original envelope consists of aluminum curtain walls and spandrel panels, as well as a glass vestibule with a glazed roof. The interior of the building is known to be cold in the winter and warm in the summer, causing discomfort for the occupants. 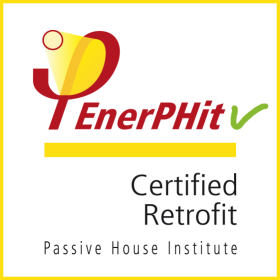 B+H Architects will be helping Humber achieve EnerPHit Certification through a holistic approach that will include a complete envelope retrofit that is highly insulated and airtight. There will also be energy efficiency upgrades on the HVAC, lighting and a new PV system. Humber is hoping to display this building as an example for the industry on how to perform deep, near net-zero, energy efficiency retrofits in Ontario’s climate. Through certification, Humber intends to show its dedication to fighting climate change.